We are a Spirit-empowered, diverse community of believers on campus, declaring in word and lifestyle our faith in Jesus Christ, equipped to fulfill our purpose in God’s global plan. It means real friendships with brothers and sisters that last for well....eternity :). In 2 Corinthians 5:20, the Bible talks about us being Christ's (X=Chi) Ambassadors (A=Alpha). So the name Chi Alpha comes right from the Bible, which may make us the oldest greek organization, (lol), but what it really means, is that you have instant family, friendship, brotherhood, sisterhood, a genuine community (Acts 2:42-47) with a group of people who sincerely want to change the world...all starting with this little world we call Rutgers. If you are searching to discover who Jesus is personally to you, or are already a follower of Christ, Chi Alpha Christian Fellowship is a family of students loving God and loving people. To go a little deeper check out XA Essentials. Join the Family, Change the World. Each week we get together in "Large Group" and "Small Group" times. LIFE GROUPS are really where friendships and growth in out relationship with Jesus deepens. LIFE GROUPS are small groups of 5-10 students, guys and girls groups, meeting weekly for life catch up, encouragement, prayer, and Bible Study...and a little fun thrown in. 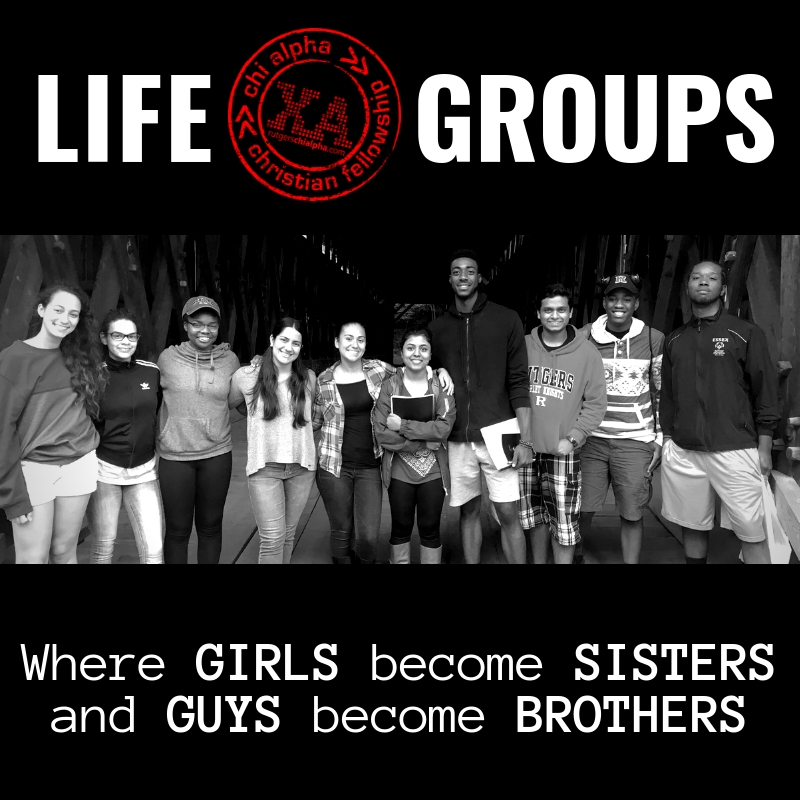 Chi Alpha is really a fellowship of LIFE GROUPS meeting on the 5 campuses of Rutgers. LIFE GROUPS meet Tuesday - Friday each week. Rutgers Chi Alpha Christian Fellowship is a nationally chartered chapter of Chi Alpha Campus Ministries, USA at Rutgers, The State University of New Jersey. Chi Alpha USA is a national campus organization on over 300 campuses in the U.S.